This holiday season should be a joyous one — for criminals. 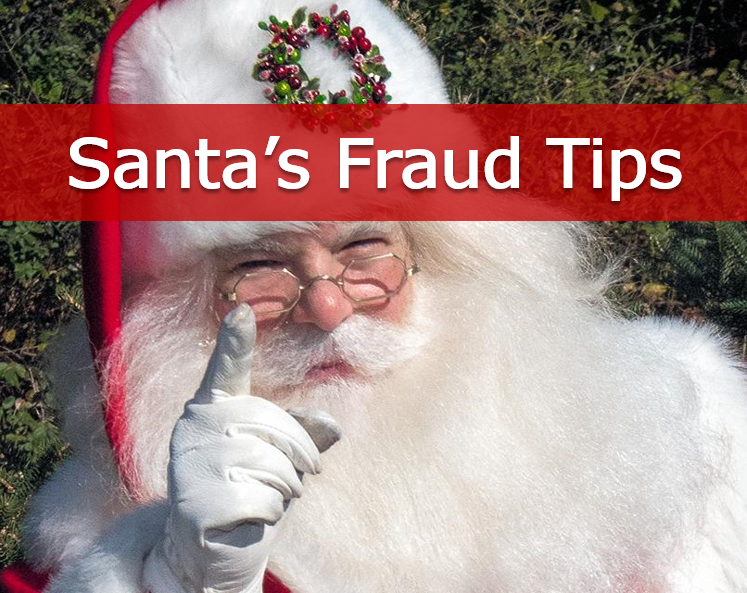 Holiday spending always makes it easier for fraudsters to steal your money, for two reasons. First, you may be so busy with shopping and parties that you don’t take that extra minute to scrutinize an email link that purports to come from a store or delivery service. People in a rush are also more susceptible to social engineering scams, and more likely to give details over the phone to someone pretending to help them get their packages delivered. Second, there are so many more transactions on your bank or card statement that it’s easy to miss those that may be fraudulent. No wonder we fall victim to more fraud at Christmas. Our hearts and wallets are open at this time of year, but don’t let the crooks take advantage of that. Here are some things to watch out for this holiday season. Alerts about problems with your package delivery. These could be legitimate, but double-check. If anyone calls and asks for your password, you know it’s a scam. Fake charity emails and phone calls. See our tips for these. Spoof emails and websites from popular brands or stores. These may look genuine, but check the links before you click. If you do click, and enter your details only to find they have been rejected, it may have been a scam. If in doubt, open a new window and put in the store’s real website. The UK consumer firm offers these tips for how to spot a scam. Great deals that are so good you want to click on them on your mobile. It’s harder to mouse over a link and know where it’s going on a smartphone than on a laptop or tablet. You might want to resist the urge to click until you can verify the source. Turn on alerts, if available, from your bank or card issuer. This can inform you when spending is taking place on your card or account. Check your accounts more regularly to make sure all the purchases are genuine. It’s easy to forget what you bought a few weeks later. Look at your privacy settings on platforms like Venmo to make sure you’re only sharing payment information you want to share. Consider using your card for major purchases, rather than paying from your bank account, because of the protection on card purchases. Don’t fall for phone calls where the caller asks for your card details. If you didn’t make the call, you don’t know it’s legit. See this advice from Action Fraud in the UK. Remember — if something seems too good to be true, it probably is! For more tidings of good cheer, follow me on Twitter @FraudBird. And whatever you celebrate, have a fantastic, fraud-free holiday.